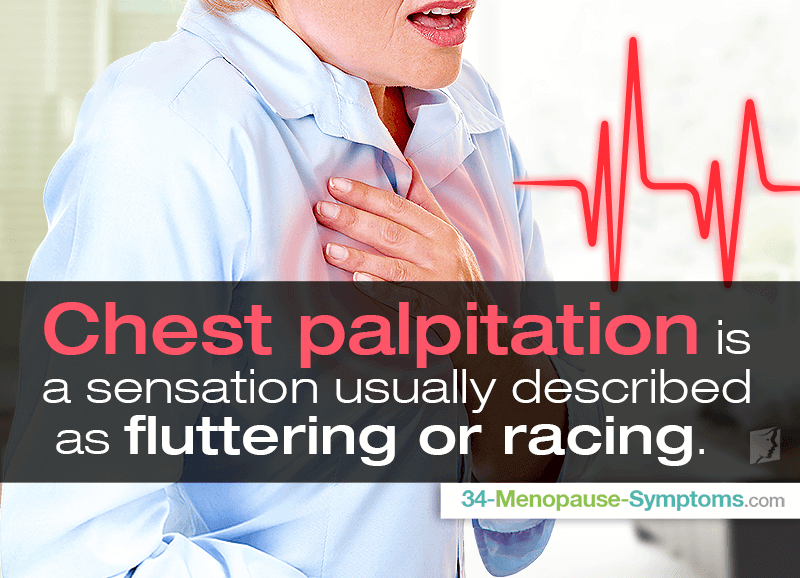 Chest palpitations commonly occur among women and for a variety of reasons. They are famous for causing anxiety and stress in those experiencing them, but good news is that they rarely signal a serious medical condition. Continue reading to become familiar with what palpitations are, what causes them, and how you can manage them more easily. Palpitation is a sensation that your heart is beating in an abnormal fashion, usually described as pounding, fluttering, or racing. Most women experiencing palpitations point to their chest, while others locate the discomfort in the neck and throat area. It is important to remember that heart rate changes throughout the day, typically being slower during rest and increasing with various physical activities. Although usually harmless, chest palpitations can be a life-threatening emergency. These symptoms typically go away within a few seconds up to a few minutes, but in some cases they last for a few hours or even days. If you also experience chest pain and tightness, seek an immediate medical attention as it might be a sign of a heart attack. Wholesome diet, including Omega-3, vitamin C, anti-oxidants-rich foods, fiber-packed whole grains, as well as low-sugar and low-fat products, can help lower blood sugar and cholesterol and protect the heart. Regular exercise, such as safe and soft on the body Yoga or Pilates positions, improve blood pressure and strengthen the heart. Daily walks in the fresh air or bicycle rides with friends are a good and fun way to stay active, too. Alternative therapies, such as breathing exercises, aromatherapy, and meditation, are excellent ways to avoid stress triggers and practice mindfulness by focusing on the present and giving all your senses a little break. Palpitations, whether caused by a transient or chronic condition, happen to all women at various stages of their life. Those going through a hormonal transition are particularly vulnerable to heartbeat irregularities and palpitations. Though worrisome at first, they can be easily evaluated and managed. Understanding the changes your body might be going through during menopause, as well as learning some useful techniques to relieve a rapid heartbeat, can help you make palpitations even more manageable. Many people panic if they feel their heart beating irregularly, but it is actually somewhat common.